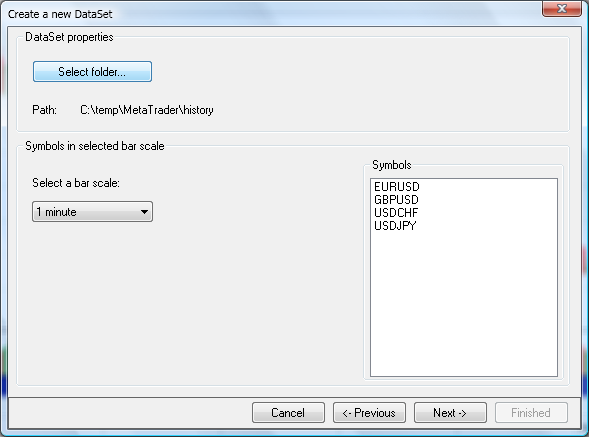 This is a static provider that provides access to historical data stored in MetaTrader 4 files (HST format). One can download several years worth of currency, CFD and indices data (from 1-minute to monthly) for free from a MT-compatible dealer. Point to a directory containing MetaTrader historical database (HST files, usually ..\MetaTrader\history) and select any HST file. Select a bar scale from the drop down menu. The wizard will scan the folder for the HST files in selected bar scale so you could finish the DataSet creation. Updating the data should be performed in MetaTrader.